The Nisswa Women's Club membership is open to any woman... all shapes, sizes, and ages are welcome. Dues are $20 annually. 2019 officers: President Marilyn Wottreng, President-Elect Diane Eitrheim, Director of Membership Norma Randall, Co-Treasurers Anne Laufman and Ann Bergin, Secretary Sharon Harris, Director-At-Large Ann Swanson, Director-TLC Barb Elmquist, and Past President Katy Johnson. Current members in Minnesota reside in: Backus, Baxter, Blaine, Brainerd, Breezy Point, Chanhassen, Crosslake, East Gull Lake, Emily, Fifty Lakes, Lake Hubert, Lake Shore, Merrifield, Nisswa, Pequot Lakes, Pillager and Stanchfield. We also have members who reside in Payson and Sun City West, AZ, Monument, CO, and St. Francisville, IL. For general inquiries, to become a member or attend a monthly meeting as a guest, please email: info@nisswawomensclub.org. To serve the Brainerd Lakes Area with charitable donations. To assist local high school seniors and non-traditional women students at Central Lakes College with scholarships. To encourage the participation of members in club activities, projects and events. To promote fellowship and support for the members. General meetings of the Nisswa Women's Club membership are held the third Thursday of each month at 12:00 noon at area restaurants. Lunch is followed by an entertaining and informative program each month. 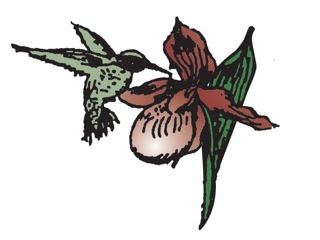 The Nisswa Women's Club logo is the hummingbird.